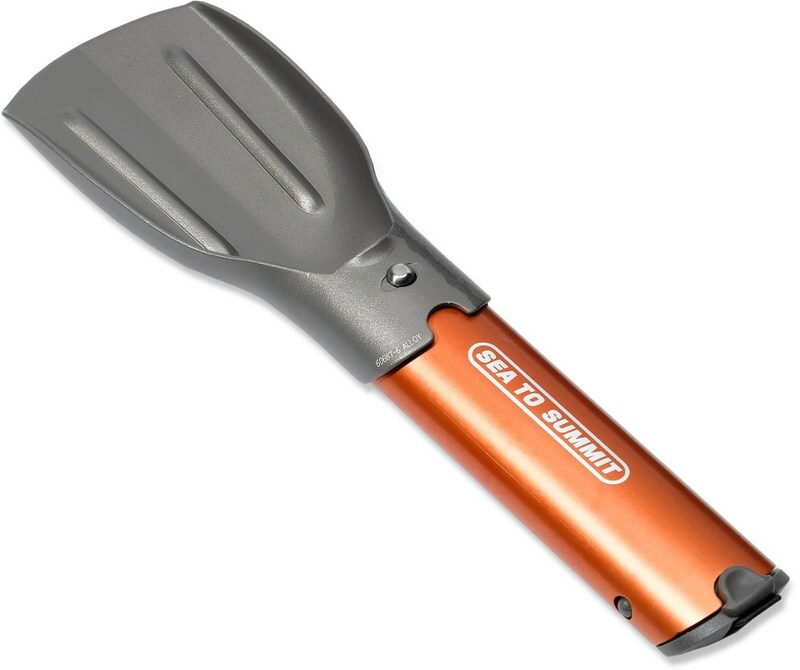 This is a very light, durable, and functional camp shovel with the added benefit of being very useful for a number of other applications around camp that might not be so obvious. I want to first knowledge that I received my Deuce of Spades as a gift for being a past Reviewer of the Month here on Trailspace and I also want to confess (and I hate to admit...) that I was really excited to be receiving this "potty" shovel as a gift. 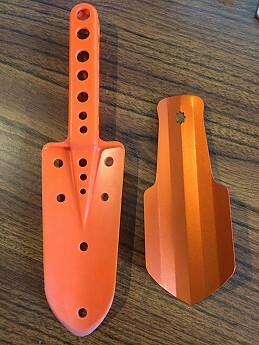 I have always been interested in gear and equipment and when I first saw the Deuce of Spades I thought it looked like a really cool shovel, but more importantly also thought that it could be very useful for a number of other applications which would make it a great addition to my pack. 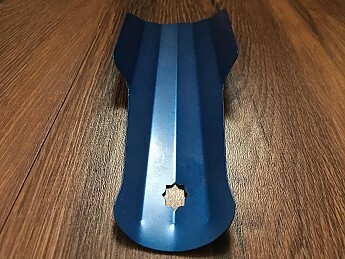 The basic shovel is 6 3/4" long and about 2 1/2 " wide and a hair under 0.6 ounces and it is made from 7075-T6 aluminum, so while the shovel is nice and light the material and method of construction make it nice and stiff and there is little risk that it would ever bend during normal use. It's a very simple but elegant design. The next photo below shows the Deuce of Spades shovel next to my existing Coghlan's backpacking trowel that is a readily available low cost trowel that has done it's job well. I tend to modify gear if I don't like something or think I can tweak it to make it lighter or better in some way and with my Coghlan trowel I went on a hole drilling spree and got the weight down to 1 1/2 ounces, which I thought was acceptable, but in switching to the Deuce of Spades I'll be saving just about an ounce (whoopee!) which really isn't that significant, but it's in the right direction. Before I go into the other not so obvious useful applications for the Deuce of Spades I thought I would touch on its basic function, which is digging holes. While I haven't had it out on a trip yet, I did take it out in the yard and dig a few holes. In my yard we have rocky/glacial till with a lot of fine surface roots and the shovel did fine with the thin construction easily cutting through roots and the tough 7075-T6 holding up well with the edge of the shovel holding it's shape with no signs of damage. Due to the thin construction of the shovel I could see using a folded up bandana that I carry in my pack as padding between the end of the shovel and the palm of my hand if I were having to dig in harder soil, but overall the shovel did its job. With respect to how well the shovel will stow away in your pack, it's nothing less than perfect in my opinion. 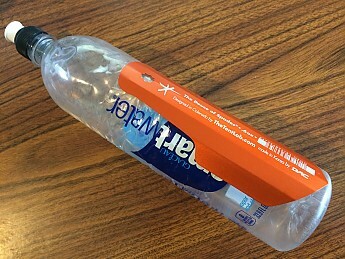 I always carry a Smartwater water bottle in one of the side pockets on my pack and the Deuce of Spades nests just perfectly with the bottle and will free up the space previously taken by my Coghlan trowel. It's like they were made for each other! Now for some of the other applications I think the Deuce of Spades could be used for beyond the simple task of being a shovel. 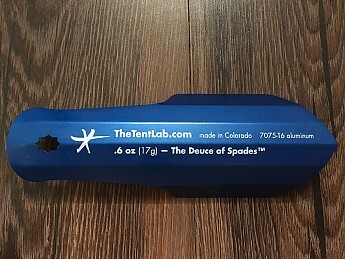 Since the Deuce of Spades is made out of 7075-T6 aluminum it has the ability to withstand a significant amount of heat and I think it would help in a pinch as a windscreen for your stove. 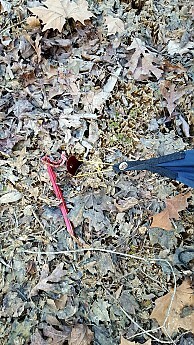 The picture below is of the Deuce of Spades stuck in the ground next to my MSR PocketRocket stove. The Deuce of Spades quite possibly could also work as a lightweight fuel pellet stove which I intend to investigate further as over the last few years I have stopped caring a stove, but have started to look to see if I can find something light and simple enough to allow for a few hot meals on future trips. As I mentioned earlier I tend to modify equipment if I think it will make it better or useful for another application and I have already modified my Deuce of Spades to turn it into a platform to hold my iPhone for taking selfies and group shots. To modify my Deuce of Spades I took a round file and made some slight scallops at the transition of the handle to the blade (the first picture below). This creates a simple shelf I can set my iPhone on when the Deuce of Spades has been stuck in the ground or trapped between some rocks. 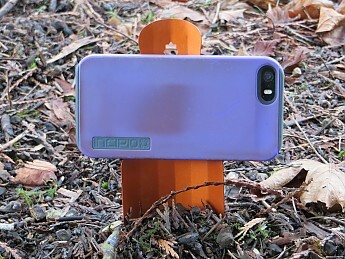 Since most people keep their shovel on the outside of their pack this makes a nice easily accessible iPhone holder for those shots you might not to want to take the time to dig around for that mini tripod you never use and wish you left behind. Probably the best alternate use I have found for the Deuce of Spades is as a shim to help make opening my Bear Vault BV500 just that much easier. Since the Deuce of Spades is made from fairly thin aluminum it makes a great tool for helping to open your BV500 on those cold days when it seems like a pain to depress the detents on the lid. A few other uses for the Deuce of Spades would be as a nice tray to hold tinder if you were trying to start a fire with a flint, as a blade screwdriver (and the rounded ears on the handle would be great to open a Garcia bear container...), and I think the Deuce of Spades would make a great lightweight finger or wrist splint from a first aid perspective. As I continue to try and reduce the weight of my pack I always like to find gear like the Deuce of Spades that can perform more than a single function and be used in a pinch to help "MacGyver" a solution when something unexpected comes up. I think the Deuce of Spades is a nice "potty" shovel, but more importantly, it is a very flexible piece of equipment that can be used for a number of existing and to be determined future applications. I will always carry and be glad that I had the Deuce of Spades in my pack. Great review, Mike! I'm looking forward to putting my spade into use in a couple of weeks. some great ideas, thanks for sharing! Since people often use stakes to double as a trowel, I also thought the DoS could double as a stake, especially in sand or snow. It is a nice, multi-function tool. Thanks for the review, Mike. I'm intrigued by your ideas for the Deuce. Please let us know how it continues to work out in all of these ways. Also, I'm glad to see that we managed to send you one in an identical color to your Coghlan's shovel for a seamless trowel transition! Nice creative uses for the trowel never would have thought of a mobile phone camera "tripod". Besides the Bear Vault, I've used my Deuce to open and close the screws on a Bearikade. For those wondering, here is a word of warning from Mike at The TentLab about heating the metal: "the two stove-related uses would probably soften the aluminum. It doesn’t take much to anneal aluminum - making it go from T6 to T0. All the strength would be gone in the heated areas." Overall, the Deuce of Spades is a cleverly designed latrine trowel that is incredibly lightweight, very strong, and takes up a very minimal amount of space. 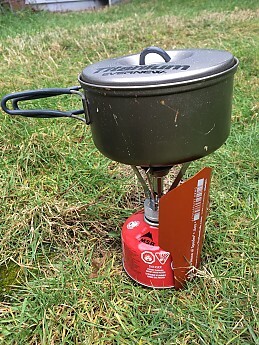 Makes an excellent gift for the backpacker who has just about everything. 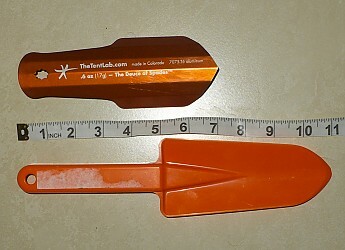 According to the manufacturer:" The Deuce of Spades is an ultralight backcountry latrine trowel that’s also the only trowel in the world that can be used right-side up AND UPSIDE DOWN. It only weighs .6 ounces but it’s super effective and ridiculously tough." As outdoor pursuits are becoming increasingly popular, it is more important than ever to minimize our impact in the backcountry. One major facet of that is dealing with the less popular topic of waste management. I think most can agree that burying waste is probably the least we can do to lessen our footprint in this regard. To do so, you need to have access to some sort of digging implement; some people like to use sticks (when sticks are available, ground is soft enough), some use tent stakes, and the rest use some type of latrine trowel. 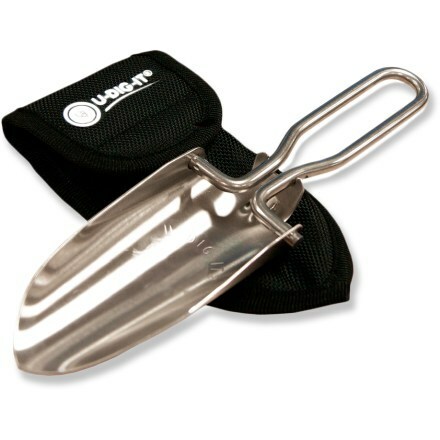 In my opinion, a dedicated latrine trowel is the optimal choice as it can be used over a variety of soil, and in comparison with tent stakes is much more comfortable to handle. The first impression when looking at the Deuce of Spades is that, for a latrine trowel, it is oddly quite cute! Perhaps this is more influence by the very cheery lineup of colors provided by the manufacturer: red, green, orange (pictured below), yellow, purple, blue, and black. The build looks very clean thanks to the clever folding of the aluminum sheet. 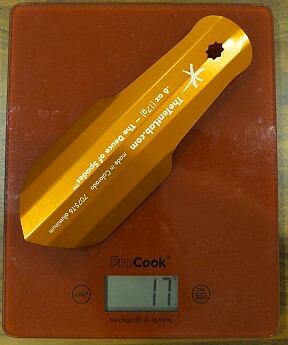 Of concern to ultralight enthusiasts, the product does come in at the as advertised weight of 17g. Even if you don't fancy yourself an ultralight backpacker, not carrying unnecessary weight or bulk should still be a somewhat attractive, albeit less critical feature. 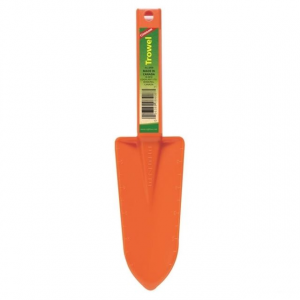 It is only fair to compare it to what I consider the standard in latrine trowels, the orange plastic Coghlan's Backpackers Trowel. I have used this for years, and was always frustrated by what I thought was its unnecessarily large size. At nearly 11" in length, it meant I had to factor in specific spaces for it, whereas the significantly smaller Deuce of Spades can just be packed away with tent stakes. The Coghlans comes in at a very reasonable 55 g and its construction of high impact polystyrene is more than tough enough to handle most soil. However, to those concerned, the nearly 70% reduction in weight, and significant reduction in bulk is worth the upgrade to the Deuce of Spades. 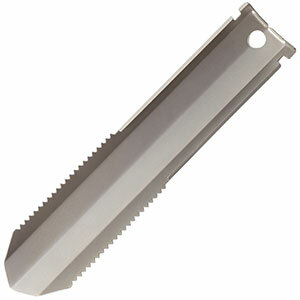 Another popular alternative is carrying an MSR Blizzard Stake (9.5", 32g, aluminum alloy construction). In most instances this is an excellent option, if a bit less comfortable to handle. It is particularly useful if you are carrying those stakes anyway for putting up shelter. 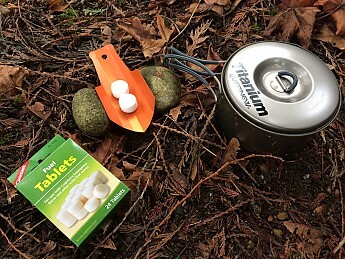 Any item that can serve double duty is always a nice bonus for backpacking. 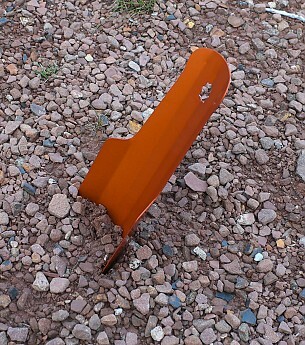 However, carrying a Blizzard Stake just for trowel use in the interest of weight savings is a lost argument compared to the Deuce of Spades which weighs nearly half as much. Ultimately, the weight, and space savings make no difference if the trowel cannot be used as intended. I have had the chance to use it over a range of soils (clay, grassy patches, sandy ground etc), but I chose to highlight the one I usually find most frustrating and that is densely packed gravelly earth. Pictured below is a 7" deep hole that took me about ~45 seconds to dig at a medium pace. Because of its shape, and relatively thin material, the Deuce of Spades readily slices into all manner of soil. The result is a very fast and precise dig. The downside is, because of the thin material, the harder you grip, or the more resistance you encounter with the ground, the more the thin material will start to dig into your hand, resulting in fatigue. This is something the manufacturer discusses on their website, which I suppose is a reasonable tradeoff for a significant weight savings. This could perhaps be addressed by dipping the handle end into rubber grip dip which would make it more comfortable, but add a bit of weight. Ultimately, this product represents a clever idea, use of quality materials, and excellent execution. For an item that will simply be sitting in your pack 99% of the time, the additional cost of minimizing its size and weight compared to the standard (mass produced) commercially available alternatives is very reasonable. This is a great product that I would highly recommend. Thanks for the review, TJ! Sounds like the Deuce of Spades worked out well. 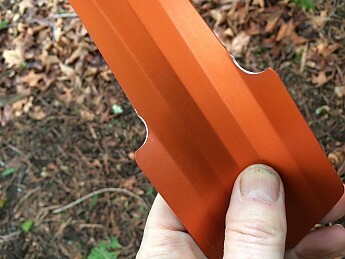 Great review, perhaps someday I'll replace my GSI plastic trowel... I've NEVER EVER had luck making a proper hole with a stick or trekking pole, and I keep trying! NECESSARY PIECE OF GEAR!!! Looking forward to trying out the one I have! Thanks for the gift Trailspace. Great review TJ. You're welcome, Chris. I hope it works out well for you and that you share your own experience with it after you've used it a good while. You've sold me. Now where can I get one? I've used mine extensively and love it! You can get one straight from the Tentlab website. G00SE, I got my on Amazon...great option if you have Amazon gift certificates to use. The Deuce makes for a fun gift too. Made in Colorado--right on! Nice review TJ, inspired me to add my own. If you need to drop a deuce, pop a squat, pinch a loaf, or grunt a stinky in the woods, then TentLab's Deuce of Spades is just what you need. However, as an all-purpose multi-tool, there are limitations. I received this as a gift from Trailspace for being a Reviewer of the Month. The Deuce is great at burying crap. 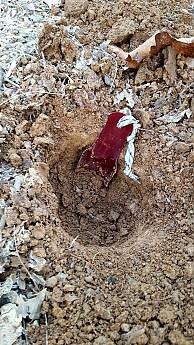 In fact, it was probably the easiest digging I've done, and I was not worrying about breaking my plastic trowel. Just imagine a pile of....political campaign promises buried here! Less successful was doubling the Deuce as a tent peg. Actually, the Deuce held better in soft soil than my Groundhog tent stake—in calm winds. When winds picked up, there was too much flex in the Deuce, and the tarp loop was able to slip off the end. Held the ground, but flexed too much in heavy winds. 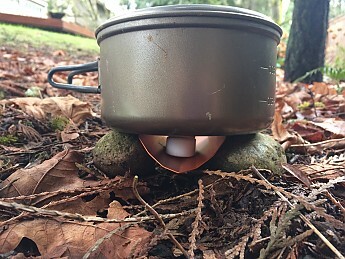 Another use, which I didn't have the opportunity to test, but I can't see why it wouldn't work would be stirring coals as you put out your camp fire. I certainly couldn't do that with a plastic trowel. So for its intended purpose, I give the Deuce 5 stars. And it does have some other perks over a plastic tool. I do not recommend the Deuce for food preparation. Okay, I will admit it spreads peanut butter just fine. 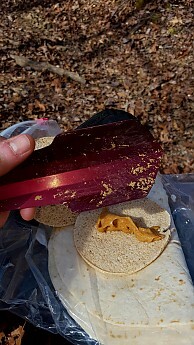 But after digging a couple of catholes, I started noticing a funny aftertaste with my sandwiches. I'm not sure what caused this. Maybe the paint on the trowel???? Nor do I recommend the Deuce for wood cutting. I spent an entire afternoon trying to cut through this log, and got nothing. So, of course, I couldn't test putting a fire out with it! 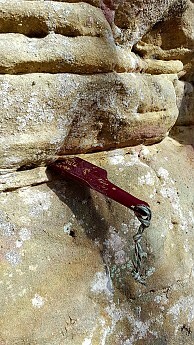 DO NOT GO ROCK CLIMBING with the Deuce! In summary...it's a great little trowel. Crappy little multitool! (Get it? "Crappy!" It's a pun.) If you're in the market, it's something to consider. I rarely laugh while reading a gear review...except for the ones on other sites that start with "I just got this yesterday". thanks! OK, I think I may have just been “goosed”! I thoroughly enjoyed your review and now feel inspired to possibly provide an update to my review with the 101 other excellent things I found you can do with a Deuce of Spades. What can I say, except I’m easy to please and I really love the design of this trowel! Mike, you should write a book. I like it Goose!...a lot of personality...entertaining and informative! How about as an avalanche shovel? Did you try that yet? Nice review! I'm glad you're enjoying your toilet trowel. We have had less than a half inch of snow all year. It's going to be 65F again tomorrow. Plus, it's all flat here. WHY DO I LIVE IN ILLINOIS? Indeed...if you lived in Florida you might at least be able to test this trowel as a means of defense against alligators. Perhaps someone can weigh in on whether it is a good bear deterrent? Great trowel, gets the job done at the same weight as titanium trowels, but for about 1/3 the cost. Thanks for the review, TJ. I wouldn't have thought there is so much to say about a trowel! I own one of these as well, got it off the original Kickstarter campaign. From your pics, TJ, it appears the final product went through some very minor design mods between the Kickstarter campaign and full retail. 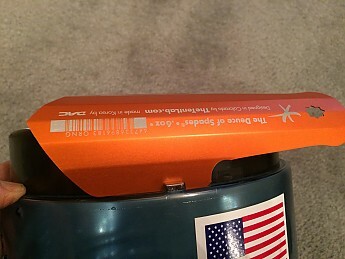 The little hole at the top of the handle on mine is not a "starburst" shape, and frankly I wonder if that shape could cut any cord you loop through it. It also looks like the handle is slightly wider and squatter than mine, but that may just be how it photographs. It's as light as the titanium trowels out there, but for about 1/3 the cost. Weight of the Deuce hits spec at 0.59 oz on my scale. Works well. It's made of thin aluminum that normally would not be very strong, but the way this trowel is shaped gives it plenty of strength for cathole digging. I also got the "gold" color thinking it would be easier to see so I won't accidentally leave it behind. I do find that the thin metal can make it uncomfortable on your hand when digging, I just wrap a bandana/lightload towel around the handle first. Some people carry no trowel at all, claiming they can just rake a hole with their trekking poles or the heel of their shoe — I've never found I can dig a recommended 6" minimum depth cathole that way and doubt those who use such methods do so either. I also don't want to tear the sole of my shoe off trying to dig a cathole with it. With the Deuce of Spades you can carry a tool that gets the job done and not worry about extra weight (my trowel is always part of my 8 lb base weight). Sorry, don't have have "action" pics, wasn't planning to post this review but then saw TJ's and had to jump on the bandwagon. 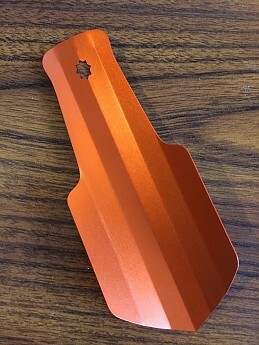 EDIT: My comment about this trowel costing about 1/3 what the titanium trowels do was based on my discounted cost of I believe $14 from the Kickstarter campaign. At $20 retail the Deuce is more like 1/2 the cost of the ti trowels. Glad to see others are enjoying theirs as well! Thanks for sharing your review of this too, JRinGeorgia. The #1 item for when I need to go #2. The Deuce of Spades is a great little trowel that works like a charm. I wrap a bandana around the handle to make it a little easier to use. Handle can dig into the hand if really going to town on the hole-digging. I received this as a prize from Trailspace for being a Reviewer of the Month. I was initially hesitant to write this review, since this product is already well covered here on Trailspace (at the time of writing, there are six reviews, all 5-stars), but the more I thought about it, the more I realized that it doesn’t hurt to add my voice to the mix. The Deuce of Spades is surprisingly good at digging holes. 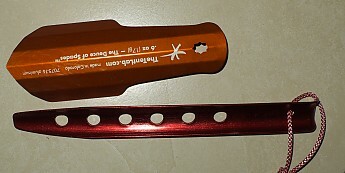 The smaller end is a handle, but in harder soils, it can be flipped to cut the soil. This works pretty well, however, not something I’ve needed to do very often, due to most soils I’ve dug in not being overly difficult to dig. The one drawback (and the reason for a 4.5-star rating instead of 5-star) of the Deuce of Spades is the pressure it puts on your hands when digging. Because it's so thin, it puts a lot of direct pressure on the hands when digging, particularly in harder soil. This isn’t going to slice your hands open or anything, but it can be uncomfortable, especially for those of us who spend most of our days using our hands for typing on a keyboard and not doing callus-causing activities (guilty!). To combat the discomfort, I simply wrap a bandana around the handle when digging, but that means I need to find my bandana first. The .6-ounce aluminum trowel is surprisingly strong for its size. At first glance, it looks like it could easily break with too much pressure, but after using it just once, I quickly realized it would take quite an effort to bust the Deuce of Spades. After two years of use, the same sentiment rings true. I've owned the Deuce of Spades for two years now, and use it only when nature calls. The areas I’ve had to dig include sandstone, limestone, and shale-laden soils, but never anything too tough or firm for the small but mighty trowel to dig through. There are a number of Deuce of Spades hacks here on Trailspace, including Mike Mineart's and G00SE's. 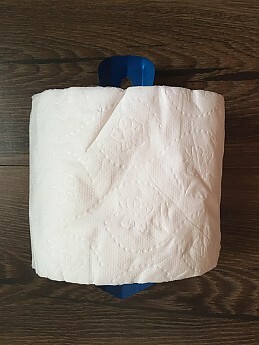 One that I'll add is that it fits nice and tight inside a standard roll of toilet paper. This works wonders for keeping both items together in my pack. The Deuce of Spades has a great trowel for me and that, after two years of use, shows no signs of wear or weakness. I have every reason to believe that it'll last for a very long time. I highly recommend it for those looking to have a reliable trowel that is lightweight and doesn't take up much room. 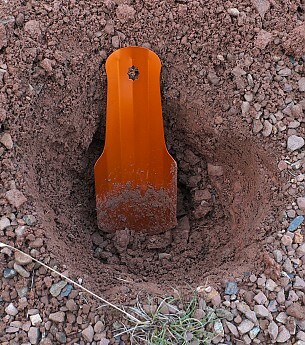 One trick I learned is to use the opposite end of the spade to start digging the hole, then switch to enlarge the hole. This relieves some of the pressure on the hands. Always worth another great review...I should do the same on a few items. 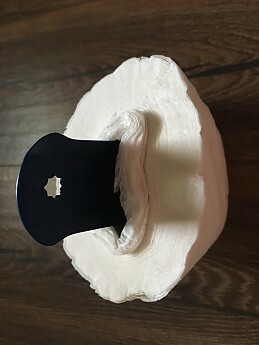 I tried storing mine in the roll as well but I never clean all the dirt off it so that didn't work for me...now it resides right next to the roll in its own sleeve...an old tent stake bag. Thanks for the review, KiwiKlimber! Even when a product has so many thorough reviews it's valuable to know how others felt and useful for ranking products. Inga, I'll give that a shot next time. Thanks! It's not a "6-ounce aluminum trowel", it's a 0.6 ounce Aluminium Trowel...It even says it on the Trowel! 6 oz is 170g, which would make it a very heavy Trowel indeed! Thanks, Alf, I fixed that typo. The period for the decimal may have disappeared during any editing (you can blame me). Thanks, Alf! Good catch. Yes, that would be quite a heavy trowel if it were 6oz instead of 0.6oz. 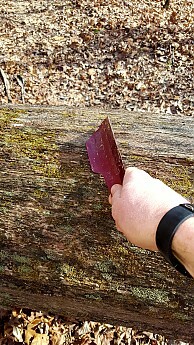 This is the best trowel to have on any backpacking trip! Small, lightweight, sturdy! It gets the job done! There are not many out there to choose from, but this is for sure the best one! I used to have a hard plastic one, but this one is way better! I received these matches as a prize from Trailspace for being a Reviewer of the Month. I brought this on my thru hike on the JMT in August. I love it! It was lightweight and small enough to fit in any side pocket of my pack. I like how strong it is. Anyone who has been hiking through the Sierras knows that there aren't toilets in too many places out there and also it is quite tough to dig a cat hole in some areas due to being mostly rocky terrain. This tool got the job done! It will be in my pack for all trips in the future. I'm glad to hear the trowel was so useful for you, Elizabeth. Great lightweight spade, and super dependable! 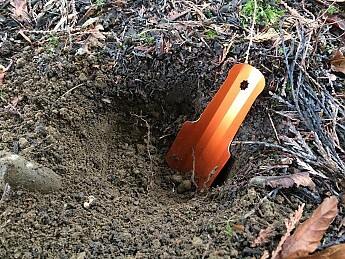 Wanted to add to previous review, that I've used the TentLab spade for several months, and have dug down in shale, hard gravel, and packed dirt in Yosemite and Santa Barbara San Rafael Wilderness area, and have had no issues with it! Great tool, and super lightweight as mentioned. Love also the fact, as pointed out, it fits nicely next to water bottle! If you don't pack a bottle, my only suggestion is to be careful packing it the wrong way in your pack side pocket, as the edges can and will tear fine mesh: consider wrapping the end of the spade in a spare sock or other cover. Thanks for the review, Bryan! It's always good to hear experiences from more users to back up (or differ with) other reviews. Thanks, Alicia and Goose for the feedback! TrailSpace has become my ' go to ' for reviews and backpacking forum, so thanks"! 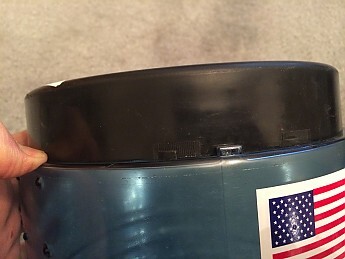 And, my BearVault BV500 has been enameled with TrailSpace stickers...okay, what's a few extra ounces! Thanks, Bryan! I'm glad you've found the site so useful.